“As You Love Me.” COMICS! Sometimes It's London Calling! 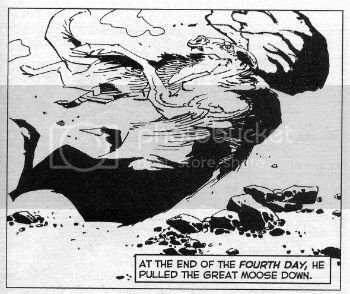 That there being Dog vs. Moose by Alex Nino from Alex Nino & Neil Kleid’s adaptation of Jack London’s The Call of The Wild. Kids, use your nascent psychic powers to guess what I’m on about this time! 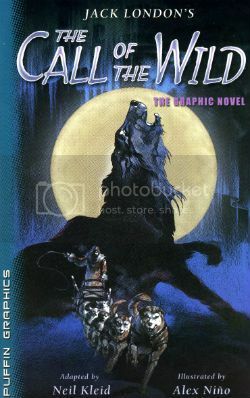 Those not hammered to the brink of psychosis via Holiday overindulgence will have already deduced that what we have here is a paperback adaptation of Jack London’s "immortal classic" The Call of The Wild. Despite London’s book having been around since 1903 I’d never actually read it. It was one of those books that when a child one’s parents would heavily suggest one read and was thus one of those books one strenuously avoided. And as is so often the case it turns out I’d been robbing myself. Turns out Jack London’s The Call of The Wild is a pretty damn good book, combining as it does two perennial childhood favourites; snow and cruelty to animals. Technically, I guess, I still haven’t read it but I have read a graphic novel adaptation by Alex Nino and Neil Kleid which was good enough to suggest I should have maybe gone to London sooner. Upsettingly it transpires that Jack London died at the youthful age of 40. On the plus side, for us anyway, he did so after writing his way out of poverty via a series of extraordinarily popular novels (and more importantly - good novels), these being based on a couple of periods of hard scrabble living he endured along the way. Obviously you don’t have to be savaged by wolves to write about being savaged by wolves; that’s what imagination’s for. But if you have been and they leave you enough fingers to set it down in words it’s probable that authenticity will give your work a little extra kick. Of course, you do still have to be able to write. Being savaged by wolves isn’t going to make up for any lack in that department. (But it’s worth a try, Dan Brown!) What I’m getting at is; Jack London wrote from experience and he wrote well. Sure, in the book at hand I’m experiencing his words at a certain remove but they are still his words. For the most part Neil Kleid’s smart enough to step out of the way and let London’s language determine the course for the most part. While largely blunt and simple, as befits his subject, London’s words via Kleid glare with brilliance in brief and arresting bursts. Now, “..his anger swelled like a kidnapped king.” are not, I believe, London's words precisley but they lose none of the magic for having been adapted. Here Kleid arranges London’s words to sit atop Alex Nino’s striking images. Alex Nino (b. 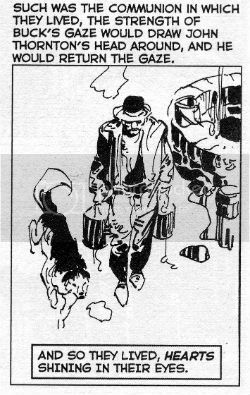 1940) is a Filipino artist whose work I first recall seeing in ‘70s DC Mystery comics (House of Mystery, House of Secrets, House of Secret Mysteries, Secretive Mysterious House, etc). His art was striking at the time and it is striking still. Not literally, no, but close; I do feel like I’ve been slapped whenever I look at his pages. In a good way; suddenly refreshed and attentive. He’s kept on going and kept up the same high standard all the way. The last time I saw his work was in the Image Comics series Dead Ahead which was about zombies on a boat and was visually insane. Seriously, I’ll have to dig that out; it’s nuts. The big thing about Nino’s art for me is how it teases incomprehensibility without ever actually falling into it, or if it does you don’t mind. Well, that’s when Nino has his druthers anyway, which he hasn’t here so it’s a far more sedate and populist performance on these pages. It’s still Alex Nino so it is still pretty spicy stuff. 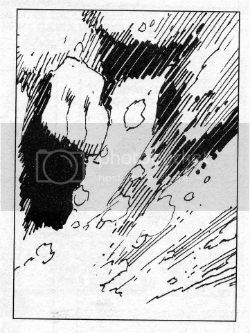 Like Joe Kubert, Nino knows the best way to draw snow is not to draw snow; so most of these snow set pages consist of whiteness. There’s no short-changing though; Nino makes what ink there is work like a harried sled dog. His figures, flora and fauna are reduced to, mostly, rough assemblages of lines; the close proximity of one to another is the only clue that they delineate the same shape. At times Nino seems to be testing how dispersed he can make his lines and still ensure the reader’s eye can herd them back together as a dog; a bush; a party of three with a heavily laden sled disappearing under fracturing ice. Maybe he’s having a bit of fun with the fact that the conditions he’s drawing are so elemental and thus reducing his work to its elements. Probably not. In keeping with London’s unimpressed view of humanity under duress Nino’s lumpen tuberous fizzogs give everyone the look of grumpy goblins. Everyone, that is, except The Man, Thornton, who is drawn in the classical hero mould and so stands out visually from his fellow humans as much as London’s text would wish him to. Throughout Nino’s art is smart and sophisticated but he’s smart and sophisticated enough to know simplicity works too; the eye is always drawn to Buck as Buck is given heavy black markings which make him immediately stand out in any given panel, largely white as they are. Fans of Nino will be pleased to note several panels of Pure Nino (a group of dogs that resemble crystal automata; a primordial vision via Nino’s signature fantasmagoria). He’s one talented son of a lady. The book closes out with a nice chunk of backmatter with script pages, sketches and preliminary layouts. From this it appears Kleid specified the page layouts for Nino. They aren’t high art but they don't have to be they just have to work, and they work well in that they carry the reader through the pages unobtrusively. Ideally, I think, at some point the reader should forget they are reading and just be reading; the simple layouts achieve this. Additionally, their basic nature provide a necessary buffer, an essential corral, for the signature manic intensity of Nino’s art. 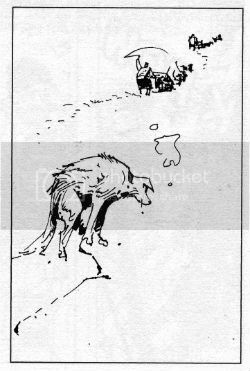 So, yeah, dogs, violence, emotions, great art by Alex Nino, a thankless task well executed by Kleid (good use of black panels, sir), great source material; The Call of The Wild is VERY GOOD!